Dare I say I see the sun this morning, after a long, dreary and rain soaked week? The forecast here in NW Oregon calls for even more 'rain' (which means thick, steady rainfall) next week. It appears to be Spring in Oregon. Time to take advantage of a break in the weather today! My weekend gardening plans call for strawberry bed thinning and adding a layer of compost/mulch. The past couple of years I've been able to use compost from our own bins. Hoping I have enough to do the same this year! I started with 8 small plants a few years ago and have slowly been able to expand this terrace garden with using the runners from existing plants and replanting them into new areas. It's been such fun (and affordable) to be able to feed my family fresh strawberries in summer grown in our own gardens. Hey Jenni, WOW! Your story of the logging truck, I am amazed too that you didn't go into early labour. The Gods and stars were aligned that day for sure. I think afterwards it is always the "what ifs" that stay with us the longest. I am so glad you were all safe. I LOVE your strawberry patch. 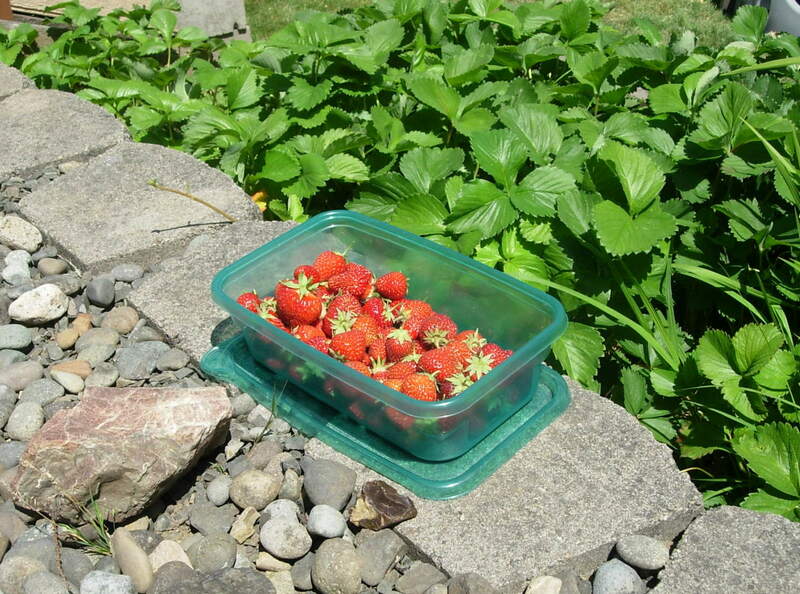 I just have a little pot with a few runners that trail off 2 plants across the patio and we only get a few strawberries a day but it is fun whoever goes out to pick the tomatoes that day gets to eat the strawberries. I am taking the weekend off,as I puttered around in the garden during the week. 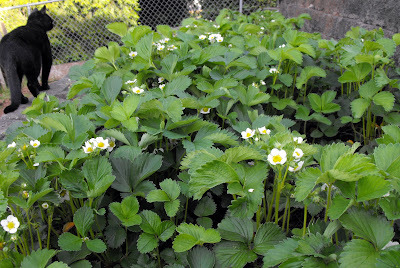 My strawberries have been thinned and all brown leaves cleaned up. Next I need a little straw to spread around the plants. We're getting that same sunshine here on the Island - at last! Thank you for your visit - it's nice to come over here to see what you're up to. I've always wanted to have a strawberry bed - maybe this year? In the meantime, I'm weeding because, as you probably know, the weeds grow very well here all winter long. I love your strawberry patch. Mine hit its stride this year and I made some awsome strawberry pies! I will be sleeping this weekend despite the great weather. I just took the week off to help my sister rip up carpet, sand, scrape up black glue, and stain the wood floors on their new farmhouse. That included rounding up 3 little girls. Old Aunt Bonnie is played out. I don't know how people with kids get anything done. You have my respect. I need to work on our strawberries too. It looks like you get quite a bit from yours. Not many seem to find their way in, usually eaten as snacks while we're outside. I managed to get some planting done, go to a plant sale and a nursery. I was hoping for a few more dry days this week, but at this point I'm happy with even just a couple that we had.